UnWrinkle Eye is an exclusive, patent pending blend of six powerful, 100% active anti-aging peptides and neuropeptides that are combined with new cutting-edge ingredients created especially for the eye area. 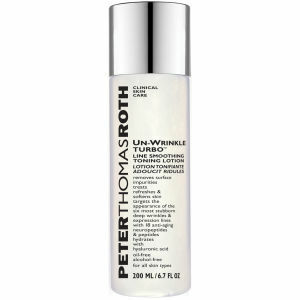 This deep wrinkle and eye expression line concentrate helps the eye area appear and feel firm and lifted. UnWrinkle Eye is recommended for all skin types and is ideal for those who have early signs of aging and for mature skin with deeper more defined wrinkles. Ophthalmologist tested and approved. Suitable for sensitive eyes and contact lens wearers. Visible results with just one application. Clinical studies have proven up to a 52% reduction in wrinkle size in 28 days. SYN®-AKE at 4% - A synthetic peptide which mimics the wrinkle relaxing properties found in snake venom. SNAP-8 at 10% - A safer, pain-free alternative to the injected Botulinum Toxin that topically helps target the same wrinkle formation mechanism. SYN®-COLL at 3% - A peptide that mimics the human body's own mechanism to produce collagen. Argireliner at 3% - A peptide cocktail that prevents the formation of lines and wrinkles. MatrixylT 3000 at 3% - A dual peptide. Push pump halfway to dispense and pat around eye area twice daily. Avoid eyelids. Water/Aqua/Eau, Glycerin, Aloe Barbadensis Leaf Juice, Boron Nitride, Cyclomethicone, Polysorbate 20, C12-15 Alkyl Benzoate, Prunus Amygdalus Dulcis (Sweet Almond) Oil, Cyclopentasiloxane, Prunus Amygdalus Dulcis (Sweet Almond) Seed Extract, Acetyl Octapeptide-3, Acetyl Hexapeptide-8, Palmitoly Tripeptide-5, Palmitoyl Oligopeptide, Palmitoly Tetrapeptide-7, Silica Dimethyl Silylate, Peg-12 Dimethicone, Tocopheryl Acetate (Vitamin E), Retinyl Palmitate (Vitamin A), Dimethicone, Methyl Gluceth-20, Polysorbate 20, Allantoin, Sodium Polyacrylate, Dipeptide Diaminobutyroyl Benzylamide Diacetate, Triethanolamine, Butylene Glycol, Sodium Hyaluronate, Caprylyl Glycol, Hexylene Glycol, Carbomer, Disodium Edta, Phenoxyethanol, Methylparaben, Butylparaben, Ethylparaben, Propylparaben, Isobutylparaben. I love this eye cream....works great but to see results you do need to use it consistently and takes a while for results to be visible. Very worth the price. I am 48 and have crows feet and deep wrinkles around the eyes. My mom came to visit and as soon as she saw me, she said my wrinkles were much lighter and asked what I had been using. This is the only product that has noticeably lessened my wrinkles and is well worth the price! Plus it lasts 2 months for me becasue I just dab a little around the eye area twice a day. For those who are looking to reduce crow's feet and dryness around the eyes this is the product for you. It really honors its name...un-wrinkle eye cream: it firms, lifts, and hydrates you eyes. I was also surprised to see results fast (in about 2 weeks)!! I have tried everything unded the sun but nothing as effective as this product. **Only use on lower eye section over orbital bone. After using it for about two weeks I am sorry to say I did not notice any diminishing in the fine lines and wrinkles around my eyes. But I am glad that this product works for others. As I always say... different people... different results. It may work for you... who knows. I used to work for a national beauty chain & always liked PTR products- (in addition to many others)I'm a fan of lines that rely on scientifically proven ingredients like Matrixyl 3000,Argireline, and neuro-peptides. I don't care for marketing blather and over-packaging AT ALL.Unwrinkle Eye cream is a bit more than medium weight, but not overly oily or rich. This cream is meant for someone who already has visible lines and/or crows feet.Some Women complain eye creams don't work- because they simply don't use enough product! An amount the size of a pea for EACH eye is correct TWICE a day. Avoid your lid area, use under the eye, around the browbone and in any lines or crow's feet. Expect to see results in about 6-8 weeks.I "ve used the Unwrinkle Regimen for 4 months & friends ask if I've had "work done". I've met grandkids of classmates who tell me " No Way" I went to school with Nana since I'm so much younger than she is! Bottom Line: Great Product, Great Line, Great Results. Worth the price. I had high expectations for this product based on the reviews and hesitantly spent the money to buy this. The cream does lessen the look of very fine wrinkles somewhat, but I have used many eye creams that do the same thing at a fraction of the price!! This eye cream did nothing dramatic that would justify its price tag. I expected much more from the rave reviews and took into account, of course, the negatives before purchasing. I am almost done with my first (and final) tube and have not had good nor bad results. This is very average and, for the price, not worth it. I didn't have any irritation issues, but I also did not see a difference at all in puffiness or lines, but it seems hydrating enough. La Roche Posay (Hydraphase Eyes) works better for me, but I am still on my quest for the perfect eye cream. Have tried many different eye creams; Prevage being the last used. This is working to help the undereye circles and make the under eye firmer. I am 64 and am really pleased the way this product is helping my concerns!